UPDATE: THIS IS NOT ABOUT THE UNDER-$200 NETBOOK WITH WINDOWS CE, WHICH IS A TOTAL PIECE OF JUNK. Please don’t ask me about those. They’re junk. If the tips in this entry help you, please send me an E-mail message letting me know! I GREATLY appreciate feedback! A lot of professional reviewers out there seem to have nothing but bad comments on the original (non-Meso) Sylvania G netbook. I bought one of these puppies for $300 and felt like I was getting quite the steal. Then again, I’m a Linux user, so I feel more “at home” with a Linux laptop (though my primary line of work is obviously fixing all the problems under Microsoft’s OS every day of my life). I love my Sylvania G. It’s tiny, light, the battery lasts forever, people look at it and think I’m watching a DVD on a portable DVD player rather than computing, its wireless actually works far better than I expected…the list goes on. Granted, it lacks some software that I’d like, but for its primary purposes (Internet browsing, light office apps, maybe an MP3 here and there), it does the job beautifully. I wish it had all the shortcuts to all the control panels available, but they’re not there because the 800×480 WVGA screen can’t handle them vertically; I’ll tell you how to bypass the vertical issue in a minute. The main reason I’m writing this is not to explain why my G is so awesome, but rather how to make it that way. The number one complaint about the G is its postage-stamp sized mouse trackpad, and believe it or not, the laptop comes with the tools needed to fix the insane acceleration that it comes with by default (no more “buy a USB mouse if you’re going to buy this laptop” complaints!) The biggest advantage of the G over the practically identical Everex Cloudbook (which the G is basically a rebranded version of) is that unlike the Cloudbook, with its moronic “mouse buttons on the left side of the unit, mouse trackpad on the right” layout, the G has the touchpad assembly below the keyboard, WITH THE BUTTONS IMMEDIATELY BESIDE THE PAD. 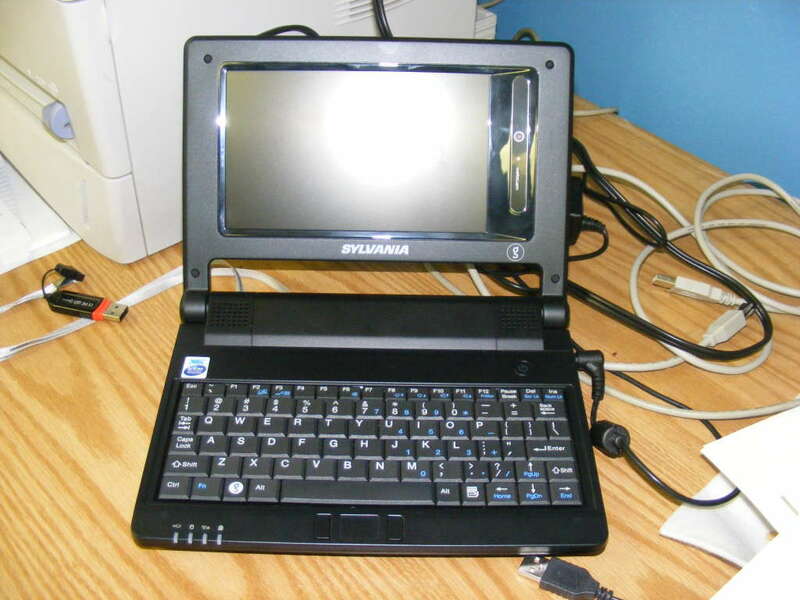 That leaves the excessive tracking speed (where you can just lift your finger off the pad and the mouse moves two inches across the seven-inch LCD) as the only remaining issue, and HERE IS HOW TO FIX THE SYLVANIA G NETBOOK POINTER TRACKING SPEED, STEP BY STEP! For $300, and with my tips above, the original Sylvania G is an absolute gem. You simply can’t beat its value unless you drop another $100 on an Acer Aspire One (what I originally wanted but couldn’t justify purchasing.) Once you slow down the mouse and add some launchers for some helpful applications, the G starts to look far better than it may have on display in the store. I don’t know about the Meso, but I don’t care, because I’ve found the perfect laptop for my needs and that’s the end of the story! I absolutely LOVE my G! Once again, please send me feedback if this helps you out!